establishing ABEC Inc. in 1974, he has worked tirelessly to bring new and exciting innovations to market. Among his most notable inventions was the first commercial computer controlled fermenter in the world, which is still in operation today at the Institute for Protein Synthesis in Moscow. In addition, he was credited with designing and building a production facility for TPA, a surgical anti- clotting factor that became the world’s first commercially successful mammalian cell produced product. 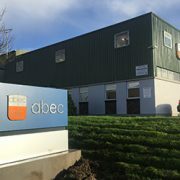 ABEC has achieved similar milestones over the course of many decades, including development of the first automated production fermenters in the 1970s, the first production scale cell culture bioreactors in the 1980s, and the first large scale cell culture bioreactors in the 1990s. Mr. Wilson launched a career as an engineer in the late 1940s. Shortly thereafter, he was recognized for his sales potential and appointed to various management positions within the field. Mr. Wilson eventually found a way to combine his industry knowledge with his business acumen when he assumed the role of president of Fermentation Design. At the dawn of the biotech era in the 1970s, Mr. Wilson saw an opportunity to become an innovation leader in bioprocess engineering and equipment design. He chose to establish ABEC Inc. in 1974 as a way to produce commercial scale fermentation and bioprocess equipment. Since then, Mr. Wilson has obtained three patents in the control and instrumentation field and has authored several papers and textbook chapters relevant to his industry expertise. Likewise, ABEC has continued to flourish as a leader in delivering integrated process solutions and services for manufacturing in the biopharmaceutical industry. The company has become a household name to the majority of the world’s biopharmaceutical and biotech companies, which have come to rely on ABEC for the highest quality bioprocess services and integrated solutions. At the helm of ABEC Inc., Mr. Wilson maintains responsibility for all aspects of business operations, as well as marketing, training, manufacturing and building the company. Alongside his wife Jean, he established The Jack and Jean D Wilson Founders of ABEC INC Endowment for Health Sciences and Nursing at Cedar Crest College in Allentown, PA. For his professional efforts, Mr. Wilson was presented with the 2010 Export Achievement Award from the U.S. Department of Commerce, which was presented by U.S. Senator Bob Casey at ABEC. Further, in recognition of his commitment to both customers and employees alike, he was named Pennsylvania Employer of the Year in 2013 and inducted into the Lehigh Valley Business Hall of Fame in 2014. He credits his own achievements and those of ABEC to his late wife, who was his beacon of inspiration, and an equal contributor to the founding and success of ABEC. Most recently, Mr. Wilson was the subject of a memoir, titled “We’ll Think of Something: the Life of Jack Wilson,” which was released in 2017. Within the publication, he shares countless anecdotes inspired by his own life and work in an effort to aid the innovators of tomorrow.